FuzzyWasabi: Diggin' Up Down Under Official Release LP ! 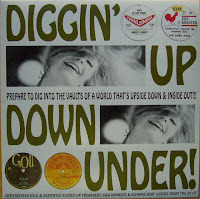 Diggin' Up Down Under Official Release LP ! Happy New Year to all you Ladies and germs, faithful followers of this backward spot in the websphere! Time to get back to business. Here's the official Dig The Fuzz release of Diggin' Up Down Under. Now you can discover all the work that went into this LP, just compare it with the promo release. As usual, time is needed to listen and relisten to a bunch of tracks in order to find the perfect flow. Some weaker tracks are gone, the flow is seamless and the new songs are killer. This really showcases DTF impeccable taste and selection. 1000thx for your work !! and 1 up for back of promo !! !